Today on the Doc On The Run Podcast were talking about all the special considerations for runners when they seek treatment for a neuroma. If you are a runner and you have pain in the ball of the foot there are really only a few conditions that could be causing the trouble. This episode will be the first of a three part series that explains all of the things you need to think about if you’re a runner seeking treatment for any of these problems. Because the fact is runners are more active and should hold their doctors to a higher standard. Some of the more commonly performed neuroma treatments can cause unnecessary risk and jeopardize your ability to run. And after all, if you have a neuroma your ultimate goal is to keep running so you have to make sure that treatment the doctor offers you is not going to cause a different problem that could affect your ability to run. The most common cause of pain in the ball of the foot is most likely a neuroma. So we’re going to talk about neuroma treatments and give you some things to think about, and to discuss with your doctor…before you receive any potentially damaging treatment. Morton’s neuroma is probably the most common nerve condition that causes foot pain in runners. The pain can become progressive over time as the neuroma gets bigger and becomes more intractable. Some runners wait until the pain in the ball of the foot is excruciating before they seek treatment. This is a mistake. If the neuroma has become enlarged and does not respond to self-treatments, home remedies, or non-surgical care under the direction of a physician, neuroma removal surgery may be recommended. Interestingly, surgical removal of the damaged, irritated nerve in the ball the foot is the only place in the human body where doctors routinely recommend excision of a nerve as a first-line treatment. Just because surgical excision is routinely recommended does not mean that surgery is the best treatment for runners. Before you consider surgical excision of neuroma you should understand the surgical risks of neuroma surgery as well as the biomechanical implications that are unique to runners. Surgery is risky. Pain, bleeding, infection, nerve entrapment and painful scarring are just a few of the commonly mentioned risks of neuroma surgery. In fact, almost every surgical consent form I have ever read actually even mentioned “possibility of death” as a risk. But there are some subtle risks to runners that are not as frequently mentioned. The stability of your foot is especially important when you are a runner. All runners know this. We spend a great deal of time making decisions about running shoes based on the proportion of cushioning versus stability in the running shoe platform. We all know that the right amount of stability decreases our risk of running related injury and allows us to train harder, and run faster. In the case of a Morton’s neuroma, the enlarged nerve is near the bottom of the foot between the third and fourth metatarsal bones. 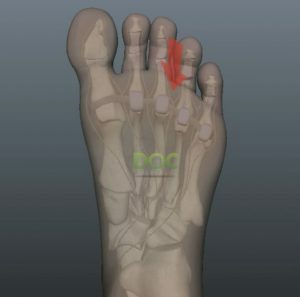 The metatarsal bones are all bound together by a connecting ligament called the inter-metatarsal ligament. This ligament stabilizes the ball of the foot and prevents your foot from splaying out like a duck when you stand up and bear weight. One risk unique to foot surgery is that you could end up standing on a painful surgical scar. A painful scar on the bottom of the foot is almost impossible to treat. Scars can never be truly removed. If you run, you would obviously not want a painful scar on the bottom of your foot. For this reason surgical incisions are most often placed on the top of the foot, even to remove a nerve on the bottom of the foot. 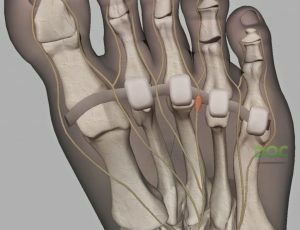 But when the foot surgeon goes in from the top of the foot, and makes his way down toward the nerve that is causing your neuroma, the nerve is hidden from view, tucked under the intermetatarsal ligament. In order to access and remove this nerve, it is standard practice to cut through the intermetatarsal ligament with a scalpel knife. The nerve pops upward as soon as the ligament is cut in two. The surgeon can then cut the branches of the nerve to remove the neuroma. After the nerve has been removed, the skin incision is closed with sutures. But the intermetatarsal ligament is never sewn back together. Because this ligament is a stabilizing structure of your foot, it is possible that cutting the ligament will cause some instability in the ball of the foot. This instability can lead to increased pronation. And again, all runners know that excess pronation can cause biomechanical problems and a predisposition to overtraining injuries. 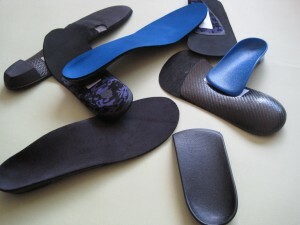 Custom orthotics are specialized shoe inserts that are built based on a mold of your feet. They are truly custom. They are perfect for you, but would not be particularly useful for anyone else, since they are molded especially for you. When I see a runner at home and cast them for custom orthotics I actually make a plaster mold of the foot right there. So obviously we have an exact reproduction of the runner’s foot. But it’s much more than just a custom molded arch support. Custom orthotics are prescribed by a physician with very specific modifications designed to stabilize your foot and take stress off certain anatomic structures. In the case of a runner with a neuroma, the custom orthotics will stabilize the subtalar joint to control excessive pronation. If designed correctly, motion at the midtarsal joint will be limited by the orthotic and decrease the mechanical irritation of the nerve between the metatarsal bones. In some cases a metatarsal pad might be incorporated into the orthotic to take pressure off of the irritated nerve by better supporting the foot under the metatarsal bones. Custom orthotics are one of the first options that you could consider prior to surgery. Although custom orthotics can be relatively expensive, they are completely non-invasive and (unlike neuroma surgery) orthotics have no significant risk of making your foot worse. Morton’s neuroma is caused by mechanical irritation of a nerve. The nerve irritation leads to inflammation. The chronic inflammatory response around the nerve leads to swelling around the nerve, and even within the nerve. Over time the inflammation becomes so significant that the nerve undergoes permanent changes. These changes in the nerve consist of “fibrosis” or scar tissue formation as well as the budding of additional new nerve endings within the neuroma. Those additional nerve endings can send signals back and forth across the synapses which your foot perceives as pain. Obviously it would be best to avoid the late stages of a neuroma where the damage is permanent. Corticosteroid injected around the neuroma. Steroid returns neuroma to normal size. The goal of the corticosteroid injection to treat a neuroma is to stop all of the inflammation around the nerve, break up any scar tissue and decrease any excess tissue around the nerve that is compressing or contributing to the continued mechanical irritation of the neuroma. The main advantage of a corticosteroid injection for neuroma is that the pain can subside relatively quickly. This of course can allow you to run again without pain if the injection is effective. The risk of a corticosteroid injection when you are a runner is that corticosteroids can cause weakening of collagen that makes up tendons and ligaments. If you have been incorrectly diagnosed with a neuroma, when actually you have a plantar plate tear or pre-dislocation syndrome, those conditions can actually get much worse because the corticosteroid injection weakens the collagen of the joint supporting structures and they can then rupture or tear completely. In that case, the corticosteroid injection would make you worse, not better. If the neuroma has been present for a long period of time and it seems that the only viable treatment is removal of the swollen nerve, there is a type of injection that can treat the problem without surgery. Alcohol sclerosing injections are designed to destroy the nerve, and have the same end result of surgery, without all of the tissue damage, destabilization of the foot and risk that is associated with neuroma surgery. Alcohol sclerosing treatment involves injecting a solution of 4% or 6% alcohol directly into the nerve. The alcohol solution causes the myelin sheath around the nerve to degenerate. This slows conduction of the nerve impulses. Basically the nerve ends up withering away and dying. This treatment is much less invasive than neuroma surgery. There is no incision. There is a much lower risk of infection. There is no cutting of the intermetatarsal ligament that stabilizes the ball of the foot. This treatment is also considerably less expensive than surgery. Instead of having surgery to remove the nerve, you can simply have a series of 3 to 7 injections that can destroy the nerve and stop the pain without all of the surgical risks and costs. If you are one of the small percentage of patients who do not respond to this treatment, you could still have neuroma surgery later if needed. Alcohol is injected directly into the nerve. Nerve withers and dies after sclerosing injection. When you have alcohol sclerosing injections to treat a neuroma you’re basically trading pain for numbness. The goal of the series of injections is to destroy the nerve to stop the pain. If successful, the result is that you’ll have no more pain but you will have a small area of numbness between the two toes previously innervated by the swollen nerve. Keep in mind this is exactly the same goal of the surgical intervention. The only difference between the series of alcohol sclerosing injections and surgical removal of the nerve is that one has all of the surgical risks and one doesn’t. Although the alcohol sclerosing injections have worked with the runners I have treated in the overwhelming majority of cases, no treatment is 100%. As luck would have it one of the patients who actually did not respond to the alcohol sclerosing injections was a friend of mine. Bill was a long time runner. He developed an excruciatingly painful neuroma. Like most runners, he had a high tolerance for pain so he ignored it for long period of time. After a while the nerve became so painful that he simply couldn’t tolerate it anymore. It had gotten to the point where he literally could not even stand for an hour and a cocktail party without sweat beading up on his forehead. We did a series of alcohol sclerosing injections but they actually had no effect whatsoever in alleviating his nerve pain. So then we decided to surgically remove the nerve. The surgery went fine and he recovered as expected. For the most part runners either get used to the numbness or the numbness actually diminishes over time. I had a massive reconstructive knee surgery many many years ago and I still have a small area of numbness but it certainly doesn’t bother me at this point. But again, I’m just trying to make it clear that whether you have surgery or you have the alcohol sclerosing injections you have to expect to have some area of numbness which may be distracting, but not particularly uncomfortable. I have heard patients ask, “Are there any guarantees with neuroma surgery?” The answer is… Yes! But that’s it! There is no guarantee you will be running pain-free after neuroma surgery. If you are a runner, it is actually more important to you than the average person that you choose the best treatment. Surgically removing the nerve is not always the best choice if you want to keep running. But once you have made the choice to have neuroma surgery, you cannot go back. Once you have surgery, the anatomy has been altered and the rules have changed. Once you understand the full implications of neuroma surgery and you have considered all of the other treatment options, surgery may in fact be the right choice for you. But you have to go into surgery with eyes wide open, knowing all of the alternatives, and believing that you have tried everything short of surgery to fix the problem. It is critical that you discuss all of the nonsurgical options with your surgeon, before you have neuroma surgery, or any other invasive and potentially harmful treatment, even a corticosteroid injection. Above all else make sure that your doctor understands that you are a runner and you want to continue to run. Explained the events that you do and the amount of training that is required for those events so that your doctor can take your desire for high level athletic activity into consideration and then determine which treatment is right for you.